Pro Tech is a "Top Notch" company especially when it comes to service. I deal with companies all over the country and there are NO other companies that can match the quick and friendly service that we get from Pro Tech Machine. Although they are small, it only took 1 single project for us to figure out that we are working with a top quality vendor. There is no doubt in my mind that Pro Tech can accomplish any of our projects. Their quality and quick response goes unmatched. The 3 biggest qualities: 1. Product/material quality is outstanding 2. Ease of doing business with them 3. Quick product turnaround times. I would definitely recommend them to anyone who approaches me about machined parts. I constantly feel bad for the need to rush proto-type projects thru their shop. Jerry and Jeff are very laid back and easy to work with. If all of my vendors were this easy to work with, I would probably start to believe that my job is easy. Pro Tech Machining does quality work that meets our demands. They have added newer and more equipment to keep up with their customers' demands and to maintain quality of work. I'd highly recommend them. 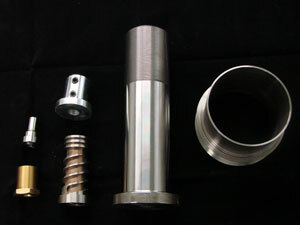 Protech Machining has been a very reliable resource for us. They are very knowledgeable, have a very quick turn around time, and the flexibility to work with their clients. No job is too big or small for them. We've been very happy customers of theirs for over 5 yrs. I'd highly recommend them for all your machining jobs.